A major health concern: Each year, one-third to one-half of the U.S. Population age 65 and older experience falls. Half of the elderly people who fall do so repeatedly. Falls are the leading cause of injury in older adults. Many falls lead to fractures and account for more than 300,000 hip fractures annually. Approximately one-half of older adults who are hospitalized for fall-related injuries are discharged to a nursing home. 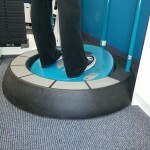 Shull Physical Therapy Center is a leader in fall risk and balance assessment. In a safe, controlled setting, we assess balance and mobility deficits of seniors and others who are referred to the program. With this information, we are able to determine and design a training program customized to meet each individual’s needs. Please fill out the following questionnaire to determine your risk for falls. This information is important for your physician to review in determining if you are a candidate for our Fall Prevention Program. Please complete and take to your physician and ask specifically for Shull Physical Therapy Center. Download one of our prescriptions to take with you when you visit your physician. Also bring a copy of the questionnaire during your first visit with physical therapy for the therapist to review. 2. Do you take medicine for two or more of the following diseases? We offer FREE Fall Prevention screenings. Please call 361-225-2539 for an appointment to get your screening scheduled.